Liberty Global, the largest international TV and broadband company which serves more than 29 million customers, has long been dedicated to corporate social responsibility. Its mission is to “empower positive change through technology” with a focus on both digital imagination — creating exciting ways to share the skills needed to thrive in the digital economy and create a positive social impact, supporting and investing in innovators and entrepreneurs to use digital technology to inspire social change, and bringing people together to use digital technology to solve the most pressing issues facing society — and responsible connectivity. 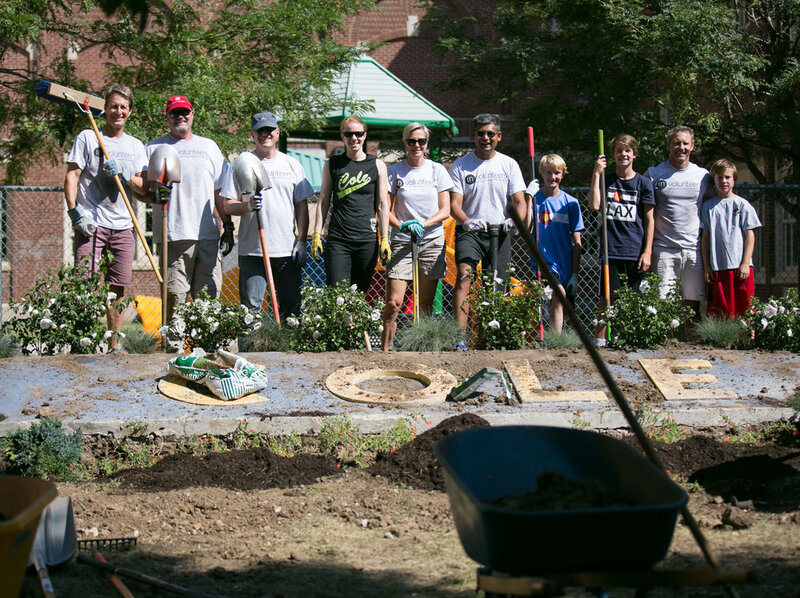 Despite Liberty Global’s lofty goals and the team’s digital focus, the organization’s employees (and their families) still get their hands dirty to improve their local community. It’s a commitment they made several years ago — when the leadership team decided to swap holiday parties for community contributions — and the initiative has just gotten bigger! This year, 80 volunteers transformed Cole Academy of Arts and Sciences, a Denver Public School, and the neighboring Boys and Girls Club. Those who worked indoors painted murals outside the auditorium and the school’s main entrance. They also deep cleaned library shelves and sorted, unpacked, and shelved books. Computer areas were cleaned, too. Teachers, who often spend their own money updating their classrooms, were greeted with an improved Teacher’s Lounge when they returned to school. Old furniture was removed, the room painted, and new furniture built and installed. Volunteers who wanted to spend time outside removed the turf, repainted signage, and updated the playground to make it safer. Donations poured into the Boys & Girls Club, including new laptops, speakers, gym mats, board games, and bicycles — from BMX models to tricycles — for use at the club. A bike repair station, which allows children to learn proper upkeep for their personal bicycles and take care of the ones at the Boys & Girls Club, was also installed. Throughout the day, volunteers met teachers and students that would be impacted by the updates. They also had the opportunity to work with colleagues who they may not normally work with and visit with co-workers' children, all highlights according to those who gave up their Saturday morning to make a difference.